The main page of the application displays. From the right side of the screen, click NEW ACCOUNT. Or, from the left navigation pane, click the drop-down arrow and select + Account. The New Account screen displays. 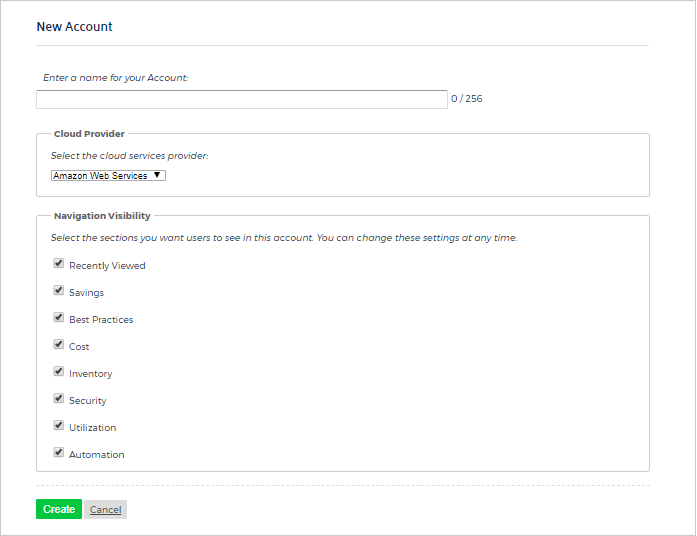 Type a unique name for your account and in the Cloud Provider section, select Amazon Web Services. Scroll down to the Navigation Visibility section. The Navigation Visibility section gives you control over which main modules and sections of the application will be visible and accessible for this account. Select the checkboxes next to the sections or modules that you want to be visible for the new account. At the bottom of the New Account page, click Create.